As Head of Innovation and Creativity at Disney, Duncan and his team helped Imagineering, Lucasfilm, Marvel, Pixar and Disney Parks to innovate, creating magical new storylines and experiences for consumers around the globe. 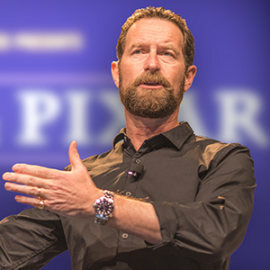 Delivering a series of keynotes, workshops and ideation forums, his unique Design Thinking process helps companies embed a culture of innovation into everyones' DNA. He is a multiple Ted X speaker and contributor to Fast Company Magazine. He teaches Master Classes at Yale, the University of North Carolina, Duke University and the University of Florida. In 2008 he received the American Citizen of Choice Award at the White House. In 2014 he was awarded an Hons. Doctorate from Edinburgh University in Scotland. He also holds the Duke of Edinburgh Award presented by Her Majesty Queen Elizabeth.